I’m honestly surprised it took this long for A & E to cave under the pressure. In fact, I saw this coming a long time ago. I mean, come on. Put on a show which has a functional family, a strong heterosexual marriage, and a strong faith in God? It was a recipe for national headlines. Phil Robertson of the Duck Dynasty made national headlines when he sparked a national debate during an interview with GQ magazine with his strong views about God, the Bible, Christianity and Homosexuality. 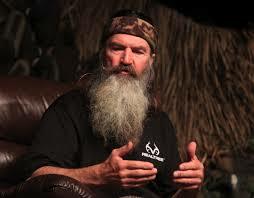 It was the perfect interview to ignite strong feelings on both sides of the issue but I am ever so thankful for Phil! Will you let me be real for a sec? In fact that seems to be my theme this year and for next: The Real Mom. #Therealmom. By now, nearly every person in this nation knows who Phil is, what he stands for, and how A & E caved under pressure towards GLAAD and others who demanded he be pulled off the air. And here’s the thing, he is the kind of man I want my daughters to marry. You read that right. I want my daughters to marry men who are full of integrity, who will not waver on how their God-loving mamas raised ’em. I want my daughters to marry men who are willing to stand on the word of God no matter what. I want them to marry God fearing, bible thumpin’ men who will not cave under the pressure to give in to our culture. In fact, I pray I raise my son to be like Phil too! Little mama, men who won’t cave under the social and cultural pressures are so rare these days. A man who is willing to stand up for his faith, his family, his marriage, his hard work ethic, and the spiritual health of his family is gem. Believe me I know. I remember the days of being married to a non-believer and am so thankful Chris is so strongly committed in his relationship with Jesus. Organizations like GLAAD, A & E are so busy running the lines of political correctness, they don’t even know what they stand for anymore, and yet the scrappy Duck Dynasty men and their families won’t be silenced. They won’t be going anywhere and that’s because nearly every God-fearing Christian in this nation has had enough of being bullied about redefining marriage, what it means to believe in a sovereign God, and what it means to be a family. I am thankful for Phil’s example. The Bible does speak against homosexuality and we would be wise to heed God’s Word. With that said, I believe it is so critically important to be the hands and feet of Jesus when we encounter someone who is not a Christian--meaning we stand firmly on the Bible and remember Jesus loves that person just as much as he loves you and I. With that said, I believe it is so critically important to show how much Jesus loves them too. We cannot begin to speak in the lives of others unless we’ve built a relationship with them first. While Phil was stating his opinion, we must remember to show how scandalous Jesus is for us, for them, for you–for everyone–not just saved sinners. We would be even wiser to explain these situations to our children (on their level, of course) so they too understand what it means to stand for God and their faith. Just this morning, I spoke with my daughter why Phil’s words caused such an uproar, people like Phil are a threat and an easy target because God isn’t popular with his laws, words like sin and how he sent his own Son as a sacrifice. And if my daughter’s happen to bring home a man in a burly beard, red necked, filled with integrity, and loves the Lord, I won’t commit social suicide like A & E, I’ll throw my arms around him and welcome him home!